My family and I had the opportunity to watch the movie, Tito & The Birds and I have to say, it's such a beautifully well scripted anime movie that the entire family can enjoy. The beginning of the movie opens up showing us how Tito's father is researching how to communicate with the birds. When the experiment doesn't go well and leaves Tito hurt, his mother kicks his father out until he can put his family before his research. After the opening of the movie we are then in the present where Tito is at his school's science fair and he is up against one other student. He has been continuing his father's research, but what went wrong in his father's experiment, also goes wrong with Tito's and everyone in the audience is forced to evacuate the building. When this happens, his mother is furious that he could be so reckless and grounds him. 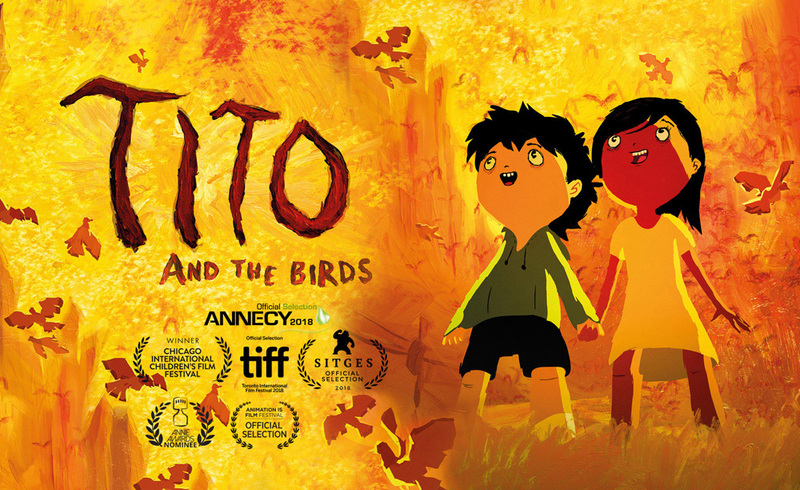 With the help of his friends and a few other kids from school, Tito is on a mission to not only communicate with the birds to figure out the bird song, but also to find his missing father. I won't spoil the end for you, but I will say that a Tito puts his fears aside and figures out a way to help save his family and friends and also is able to get his father back. A great movie for all ages to see. Tito & The Birds opens on February 16, 2019 at the Hot Docs Ted Rogers Cinema for the Toronto Animation Arts Festival International.